Journalists frequently call us with writing assignments, a need for cover and feature photo holes to fill, looking for market insights or story tips on top drawer contracting firms, to receive reliable materials to work from, and timely sources of information for their articles. 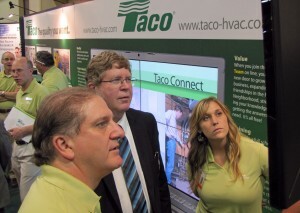 At the OESP show, Rachel works the booth with Taco trainer John Barba and visitor Bob Mader, editor of Contractor Magazine. We’re eager to represent you.Trade relations should be an integral part of any industrial or B2B marketing communications campaign. Trade magazines – both traditional and internet-based – allow you to reach well-defined, professional audiences. Product and service publicity. Whether you want to promote a new product or breathe new life into an old one, we can provide expert product, program and service publicity. We uncover unique benefits and introduce them to local, regional, national or trade journalists with ease. Most trade publications accept bylined articles from industry experts. These provide an ideal opportunity for great exposure. They also offer a forum to advance a particular issue or technology that will reflect favorably on your company, its products and services. Case histories offer companies a unique way to demonstrate their expertise. Many publications dedicate several pages each month to case histories. With hundreds of companies vying for those pages, our strength becomes your advantage when jostling with the competition. 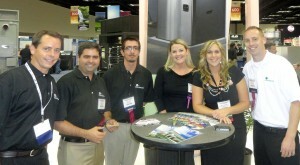 Rachel joins the ClimateMaster marketing crew for trade show media relations at Penton’s Mechanical Week. Winning editorial share of mind at trade shows is intensely competitive. Effective PR begins long before the show. Common Ground can coordinate booth and press room interviews, media events and press kit preparation to enhance editorial attention … and create a presence that translates into high-profile, post-show coverage in your most important media outlets.